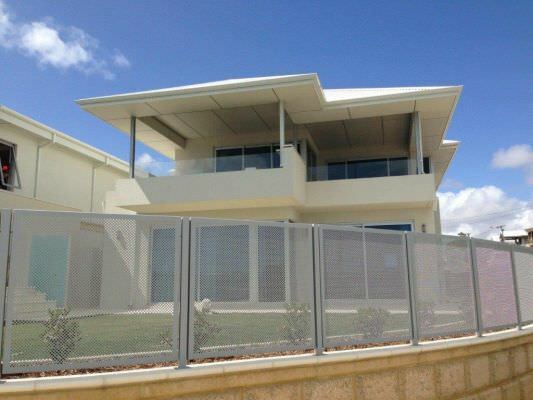 From our beginnings as a small fabricator to a national manufacturer of security gates, fence, railings and other architectural products we have remained focused on delivering the highest quality product. 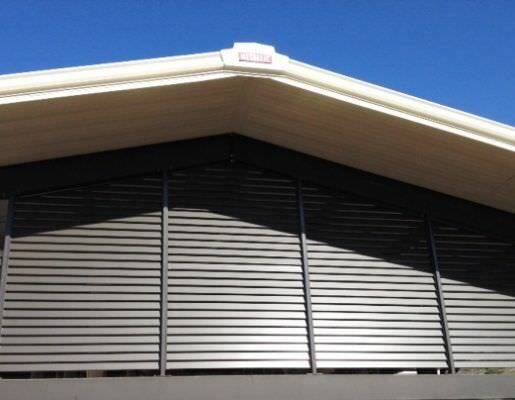 Today, our sophisticated manufacturing systems produce a wide range of building products specified by architects around the country. Thank you to our many loyal customers for making our first 50 years so exciting!! 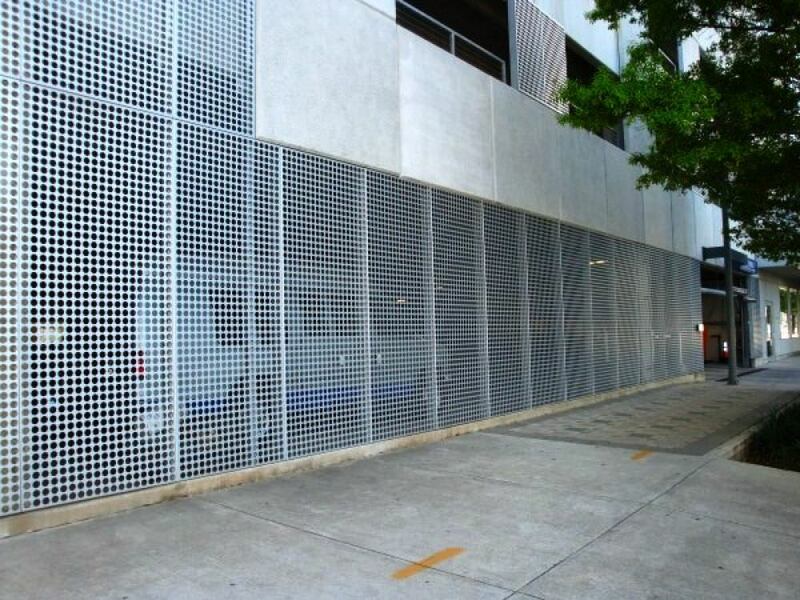 Ametco manufactures a wide range of steel fence and security gate systems as well as railings, sunshades, grilles, screens, louvers and perforated metal and plastic products. 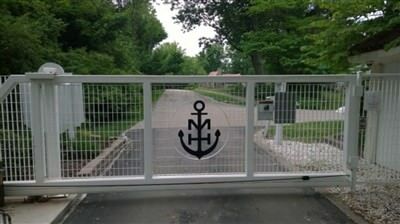 Our aluminum fence and aluminum gate designs are manufactured from extruded aluminum sections for strength and visual appeal. 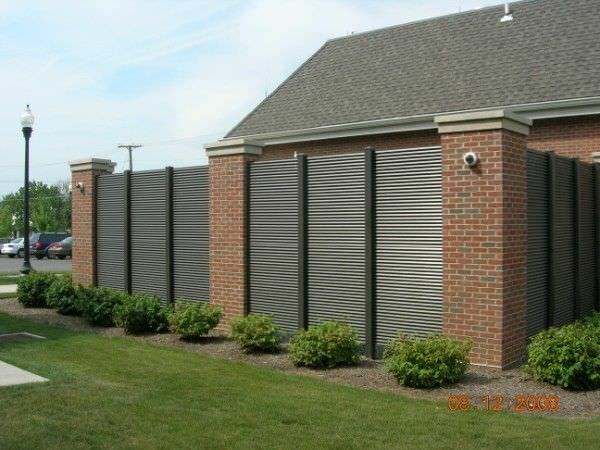 We are the "complete solution" to our customer's sheet metal and plastic needs. 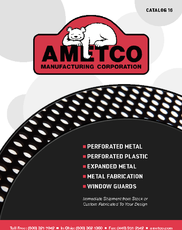 Ametco routinely finishes all or part of project by perforating and then fabricating a part to compete the operation. 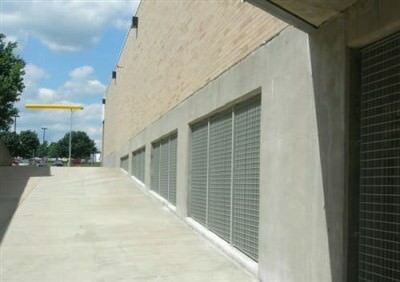 Our fabricating department is ready for your next project. 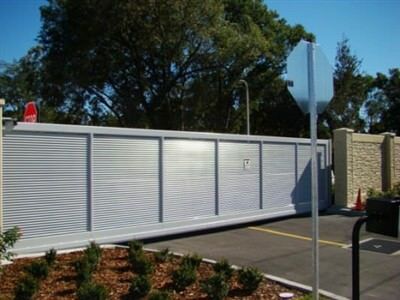 The core elements of Ametco’s fence, gates and railings are architectural panels in steel or aluminum that bolt directly onto the fence, gate or railing system uprights. 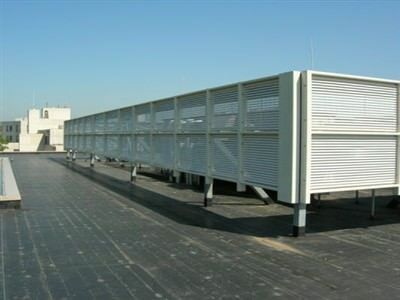 This allows for quick and easy installation, simple maintenance and immense flexibility. 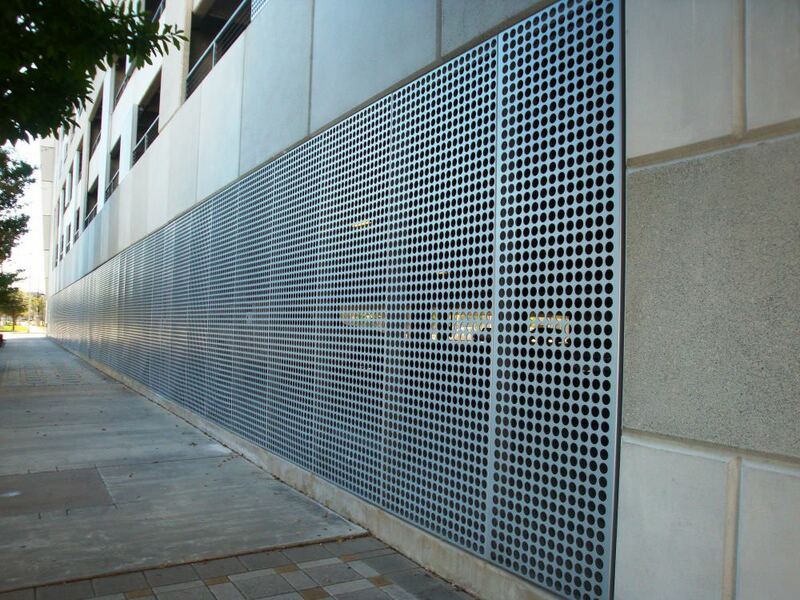 Ametco’s PERFORATED ALUMINUM FENCE allows you to select the size and shape of the opening. You can select round, square, round ended slots or square ended slots. 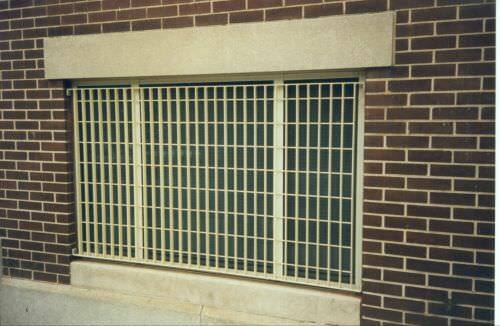 The perforations can be either straight row or staggered centers. 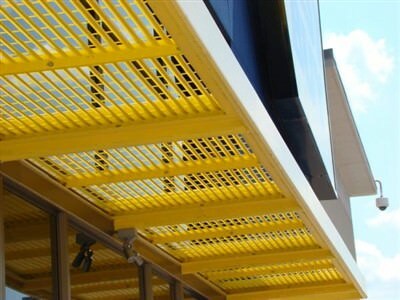 The slots can run either horizontally or vertical. In addition it lets you decide the percent of open area. 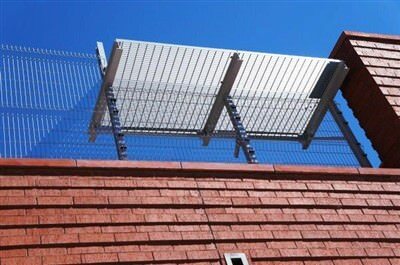 The perforated panels bolt into the tube frame section for easy installation in both the fence and gates frames. 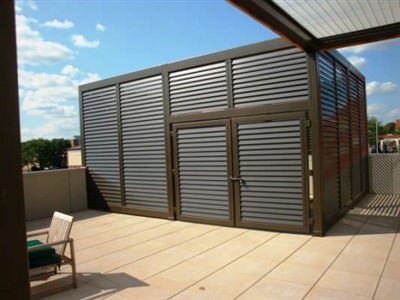 All of Ametco Manufacturing Corporation’s architectural products are manufactured in the USA. 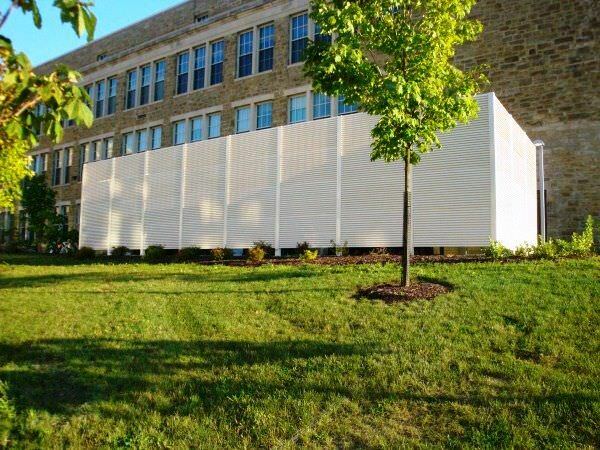 Ametco’s Phoenix Design fixed louver fencing was used at the Berks Woman in Crisis in Reading, Pa. Phoenix Design fixed louver fence provides 100% direct visual screening. 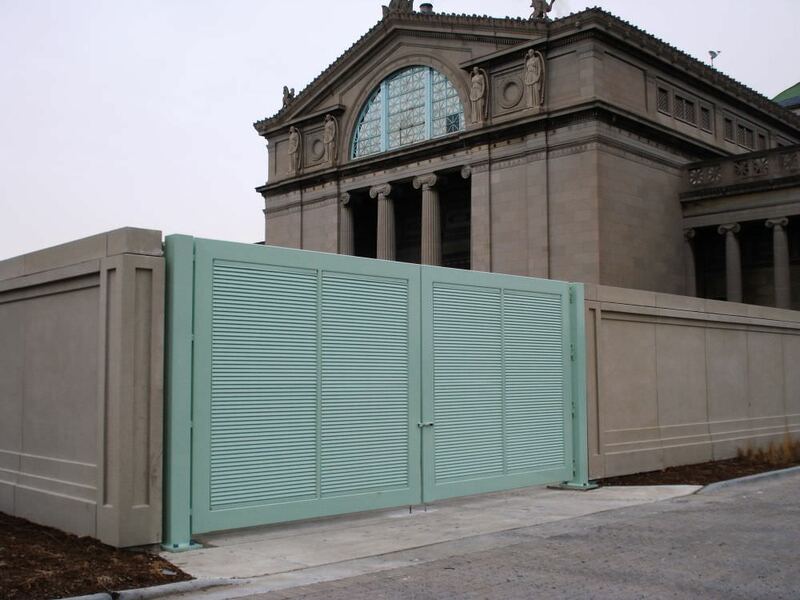 After fabrication the aluminum fence was powder coated to one of Ametco’s 15 standard colors. 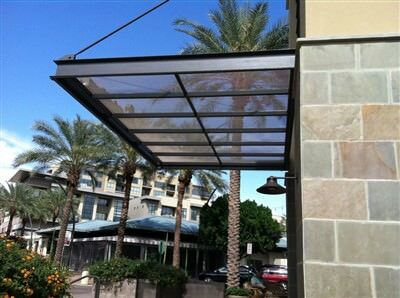 Phoenix Design can also be provided with 80% direct visual screening. 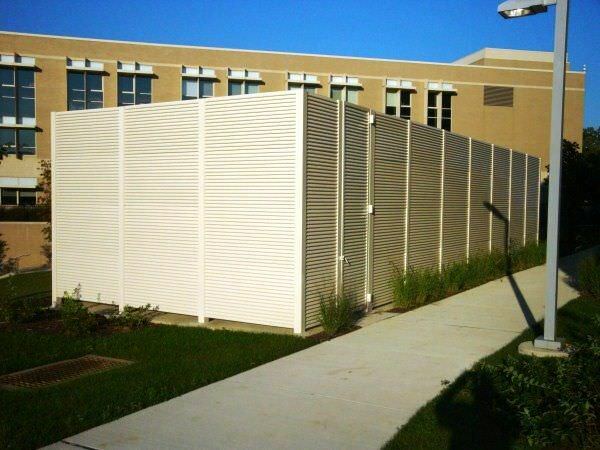 All of Ametco’s architectural products are manufactured in the USA. 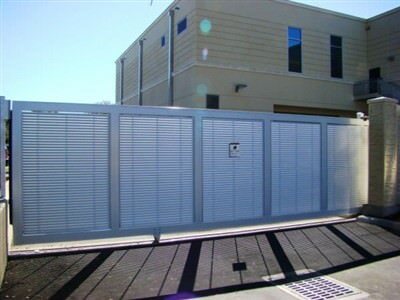 Perforated Aluminum fence panels were used at the Point Loma Wastewater Plant to enclose equipment with out cutting off the air flow required. 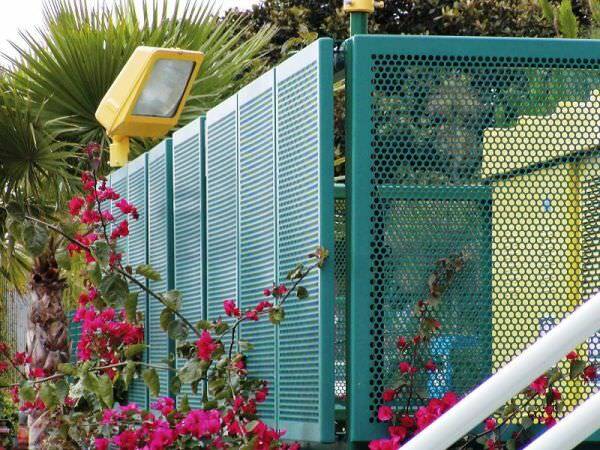 The perforated panels for the fence enclosure were fabricated then powder coated to add the attractive color. 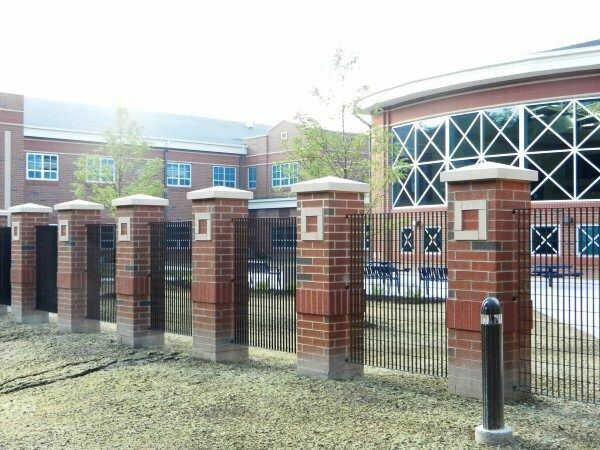 The Steel Security Fence at the Westlake Library in Westlake, Ohio used both the Steel Security Fence Metro Design and the Steel Security Fence Lattice Design in a custom fabricated configuration. 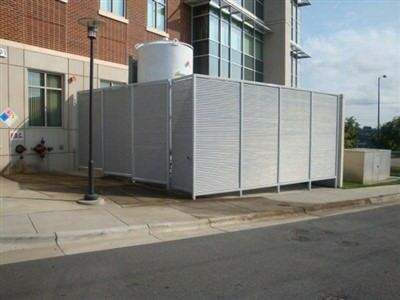 After fabrication the Metro and Lattice Designs are hot dip galvanized then coated with a polyester powder coating for the best corrosion protection in the industry . 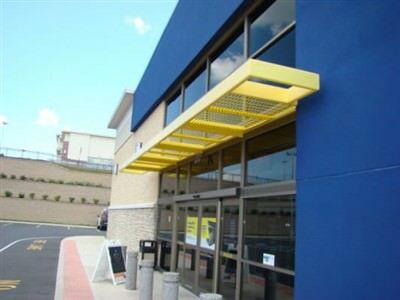 201 Louver Sunshades At Best Buy in NY. 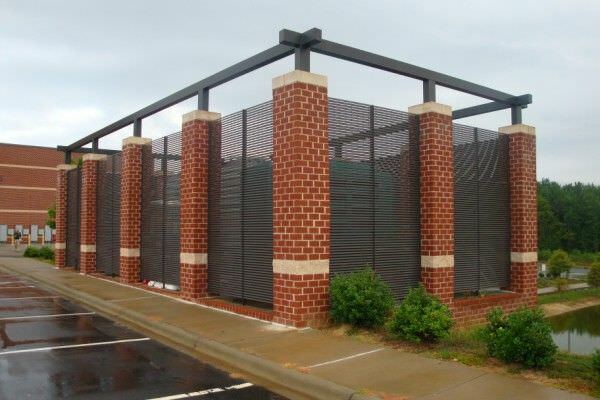 The louver sunshades by AMETCO® can be furnished in either galvanized steel or aluminum. 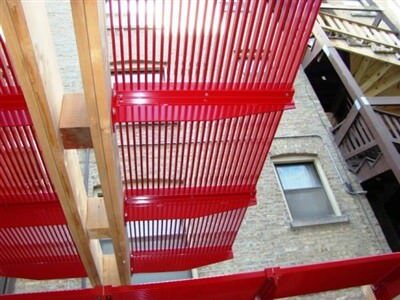 A polyester powder coating is applied after fabrication giving our customer the choice of color. 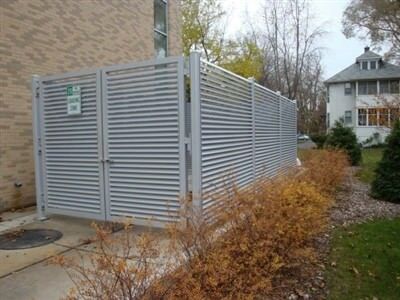 Ametco's Phoenix Design fixed louver aluminum fence and gates were used as a dumpster enclosure at Northwestern University. 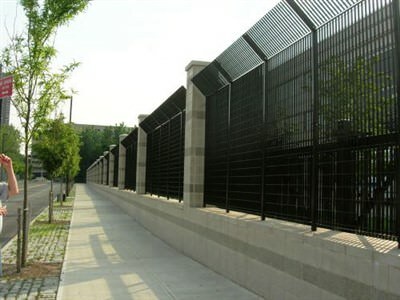 The Phoenix Design aluminum fence is manufactured from 1/2 x 4 inch extruded aluminum tube. 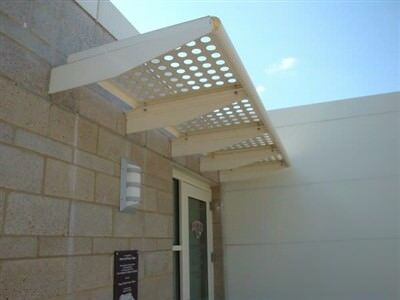 It is recommended that the fixed louver runs horizontally with either 80 or 100 percent direct visual screening. 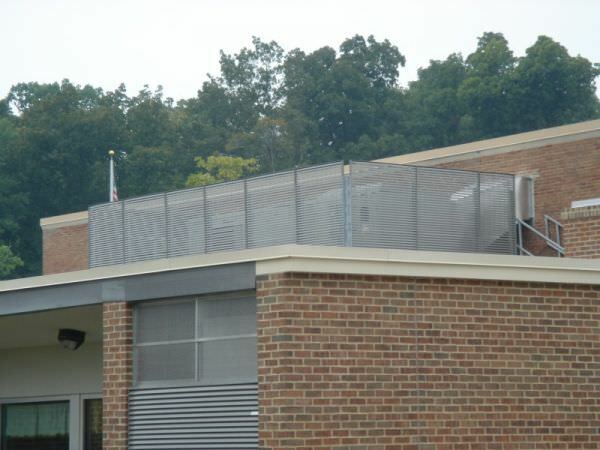 Ametco manufactures dumpster enclosures, equipment enclosures, and gates at our plant in Willoughby, Ohio. 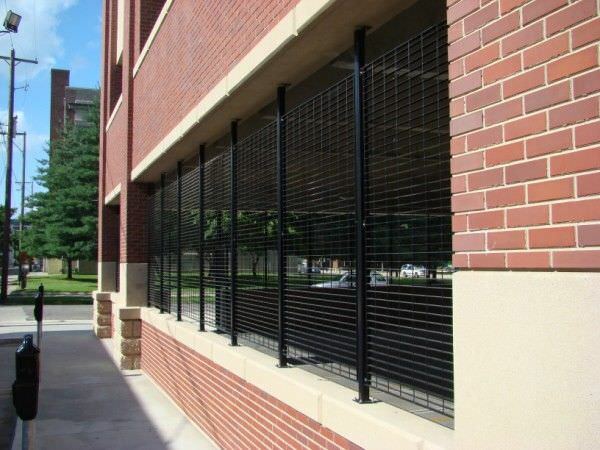 LATTICE DESIGN steel fencing is used at the Stark County Jail parking garage. Ametco® has 8 standard open mesh patterns and 5 fixed louver design that are used for the grille work in parking garages. 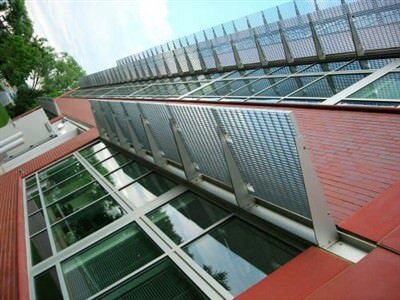 Ametco’s aluminum railings Sedona Design is pictured outside an office building in Cleveland, Ohio. 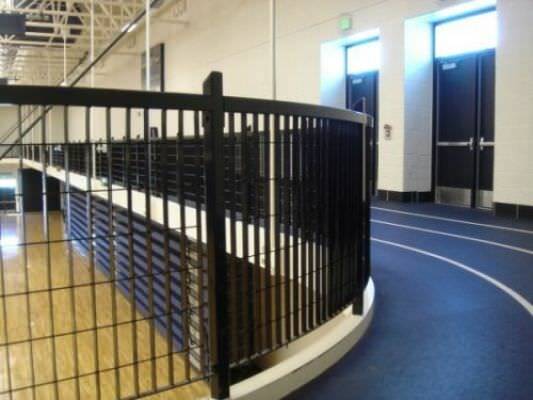 The Sedona Design railing is manufactured from alternating 4 inch x 1/2 inch and 2 inch x 1/2 inch aluminum extrusions. 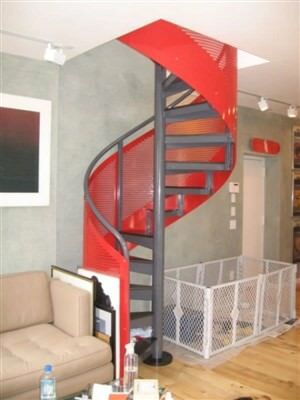 After fabrication the railing is powder coated to one of Ametco’s 15 standard colors. 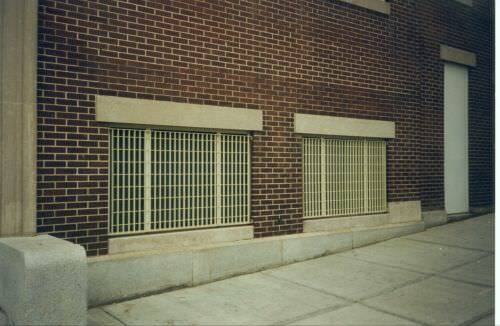 All of Ametco’s aluminum railings are manufactured in the USA at our Willoughby, Ohio plant. 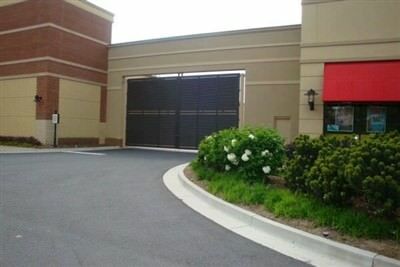 The custom 42 foot monorail cantilever gate has a steel frame with Aluminum Eclipse® Design infill panels. The monorail design mounts on a large footer. 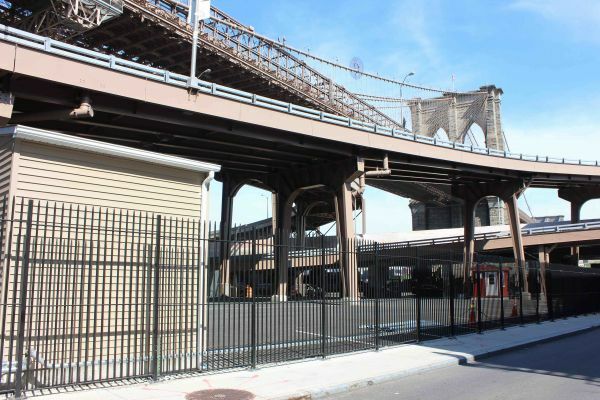 The weight of the gate in on the ground and not suspended on posts as is the case with the conventional aluminum track cantilever gates. 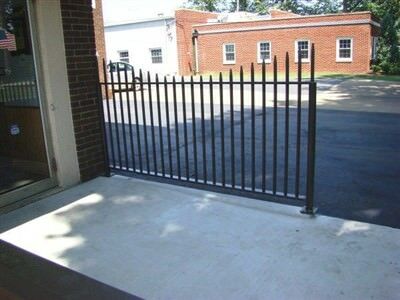 In many situations this allows a shorter overall length of the gate frame. 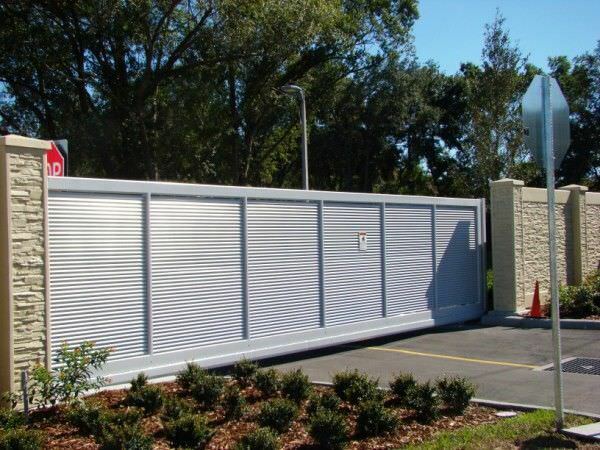 This gate was installed by Abbot Fence at the Sanford Public Safety Complex in Sanford, Fl. 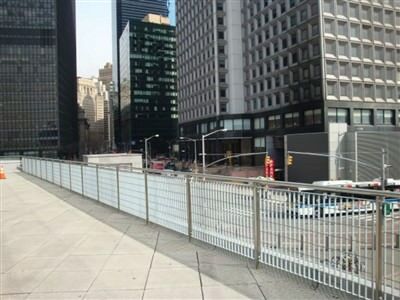 Ametco’s Shield Design was used at the W Hotel in New York. 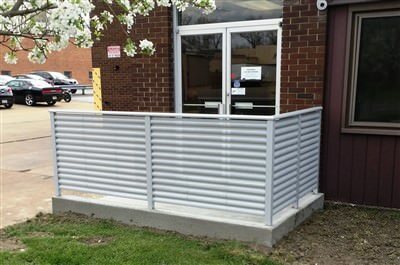 The Shield design steel railing was custom fabricated then hot dipped galvanized before powder coating to one of Ametco’s 15 standard colors. 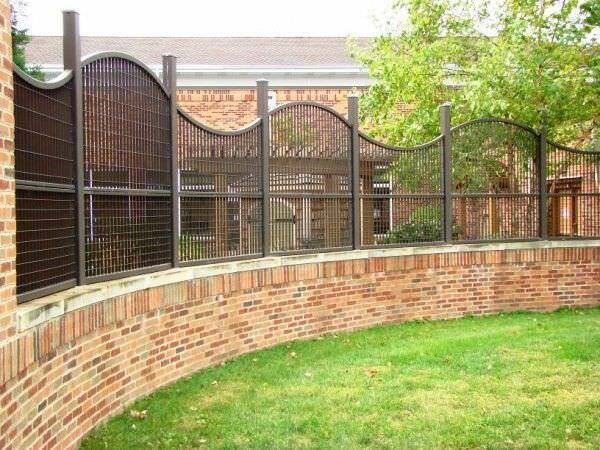 This coating system on the steel railings not only provides the best protection but allow the choice of color to harmonize with its surroundings.. 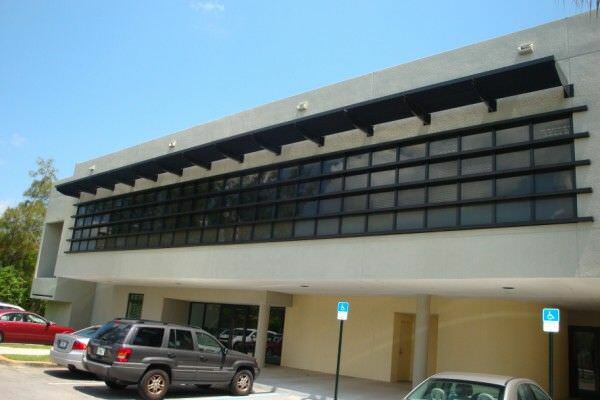 Architectural Sunshades are some of the products in building designs that can earn LEED points for the energy savings they can provide. 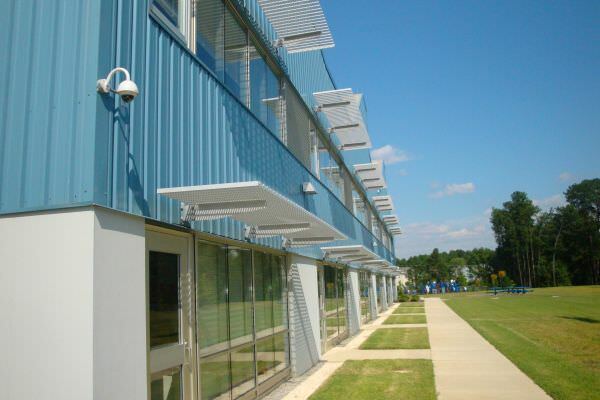 Enviromental and energy conscious architects are including steel and aluminum sunshades in their specifications. 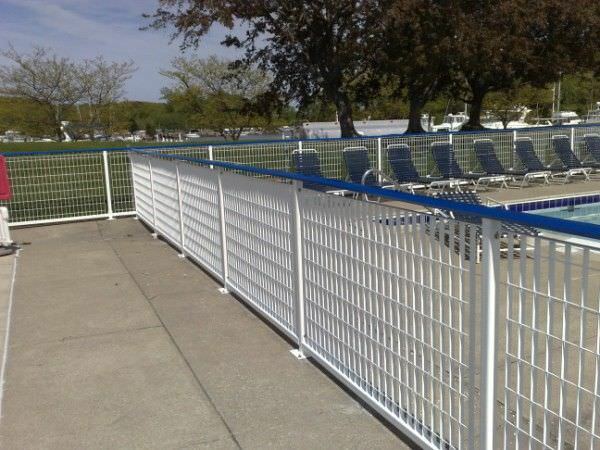 Ametco’s Steel Railings Metro® Design was used at the Mentor Harbor Yacht Club. 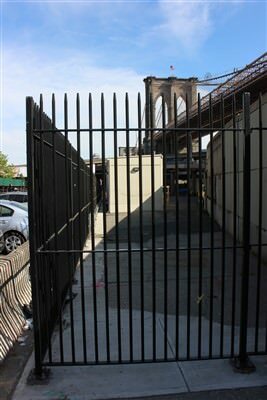 The steel railings were hot dip galvanized after fabrication then powder coated. 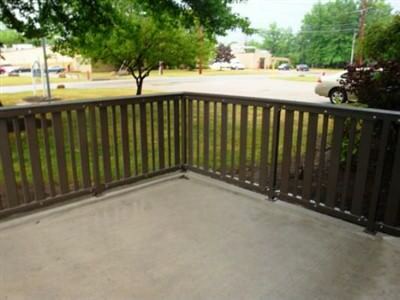 An aluminum top rail was added and powder coated blue. 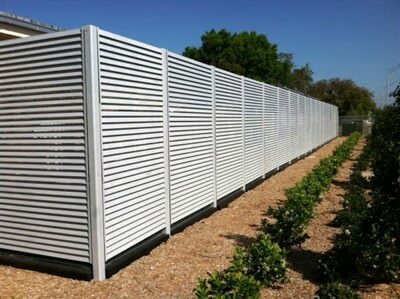 The hot dip galvanizing and powder coating insures long lasting maintenance free beauty.